The word "Wedding" originates from the Anglo-Saxon word "wedd" which meant a man would marry a woman and pay her father. Many of today's wedding traditions can be traced back to ancient customs based on symbolism, superstition, folklore, religion, and the belief in evil spirits. Some marriages were carried out by the Groom and his Brides men or Brides knights, who would kidnap a woman, the origin of "carrying a Bride over the threshold." The Groom and those with him would then fight off the female's family with swords held in their right hand while the Groom held the captured Bride in his left hand. Thus the reason a "Bride stands on the left side of the Groom" at a wedding. After he had successfully captured her, the Groom would hide his new Bride for one month to consummate their marriage. The word "honeymoon" was used to describe this one month cycle of the moon when they would drink mead, a honey sweetened alcoholic drink, which affects the acidity of the womb, thus increasing fertility. Originally, wedding bouquets were made of strong herbs, such as thyme and garlic, to frighten away evil spirits, and to cover the stench of people who had not bathed. It was believed in ancient times that a Bride was especially lucky on her wedding day. Guests would tear at her dress for a piece of good luck to take home. The tossing of the bouquet grew from the Bride's desire to offer a good luck souvenir, and prevent guests from bothering her during her reception. Early Brides and Bridesmaids wore similar dresses to confuse evil spirits. At a time when weddings were arranged by family members, a poor Dutchman fell in love with a girl whose father refused her a dowry. Their friends showered her with enough gifts to help them start a household. According to another tale, the first "Bridal Shower" occurred at the end of the 19th century. At a party, the Bride's friends placed small gifts inside a parasol and opened it over the Bride's head, "showering" her with presents! During the time when marriages were arranged by family members, the newlyweds were rarely allowed to see one another. Family members exchanging a dowry were afraid that if the Groom didn't like the Bride's face, he might refuse to marry her. This is why the Father of the Bride "gave the Bride away" to the Groom at the wedding ceremony. Only after lifting her veil just before the ceremony did the Groom see the Bride's face for the first time. When a Groom used to steal his Bride, he was forced to carry her kicking and screaming. This act of thievery has evolved into a gesture of welcoming the Bride into her new home. Originally brides tossed a garter, rather than a bouquet, at the wedding reception. In the 14th century, this custom changed after Brides tired of fighting off drunken men who tried to remove the garter themselves. The garter toss in England may have evolved from an earlier tradition of "flinging the stocking". Guests would follow the Bride and Groom to their bedroom, wait until they undressed, steal their stockings, and then "fling" them at the couple. The first person to hit the Bride or Groom on the head would be the next to wed. When arranged marriages were common, the Groom collected a dowry only after his marriage was consummated. The money dance insured that the couple would have some money before they left their wedding reception. In another tradition, the people of the village gave gifts of pottery, livestock, and garden plants to the newlyweds because the Bride and Groom had no money to acquire these things until they had children, then a dowry was exchanged. This is a European tradition to bring the Bride good luck, fortune, and protection against want. The lucky penny can later be turned into a piece of jewelry. Before the 5th century, the ring finger was the index finger. Later, it was believed that the third finger contained the "vein of love" that led directly to the heart. Ancient Romans transferred to the Groom his authority over his Bride when her Father gave the Groom her shoes. In later years, guests threw their own shoes at the newlyweds to signify this transfer of authority. This tradition is kept alive today by tying old shoes to the back of the newlywed's vehicle before they leave their wedding reception. This tradition originated in Europe to ward off evil spirits. Something Old: Symbolized the sense of continuity while making the transition from a single person to that of a married couple. Something New: Symbolized that marriage represented a transition to adulthood. Something Borrowed: Symbolized the belief that by borrowing something from a happily married couple, good fortune would follow the newlyweds. Something Blue: In ancient Israel, blue was the border color of the Bride's dress symbolizing purity, constancy and fidelity. Roman Empire soldiers would feast with the Groom the night before his wedding to say goodbye to his bachelorhood and to renew their friendships. Thinking newlyweds brought good luck guests showered them with nuts and grains to insure a bountiful harvest and many children. During years of a poor harvest, rice was tossed instead. Until President Teddy Roosevelt popularized the tuxedo, the Groom simply wore his best on his wedding day. In the days of the Roman empire, the Bride wore a girdle that was tied in knots. The Groom untied the knots prior to the consummation of their marriage. During the Roman Empire, wedding cakes were baked of wheat or barley. At the reception, they were broken over the head of the new Bride by the Groom as a symbol of her fertility. Guests would then scramble for pieces of the cake to take home for good luck. Later it became a tradition to place many small cakes on top of each other as high as possible. The newlyweds would then try to kiss over the top of the cakes without knocking them down. During the reign of King Charles II of England, a baker added icing, and today's style of wedding cake was created. In France, bread would be placed at the bottom of two drinking glasses. The Bride and Groom would then drink as fast as they could to be the first to get to the toast. The winner would rule their household. It was made popular to wear a white wedding dress in the 1840's by Queen Victoria. Before this, Brides simply wore their best dress. After her clan's castle falls under siege, the fair-haired Lady Jillian MacRae finds a way to escape with her four-year-old brother, seeking help from the handsome Kade MacLachlan, laird and master of Ravenskull Castle. Four years past their love had been strong—until her father betrothed her to another man who was later killed. Now, it is Kade she turns to for help in regaining control of her own castle from the wicked man who has taken over and intends to marry her. Once she is again face-to-face with Kade, she realizes the love she thought she'd put aside is alive and thriving. Kade is speechless when the beautiful Jillian offers herself to him in exchange for protecting her young brother and banishing the intruders from her castle—an offer he is more than willing to accept. He has no intention of allowing her to slip through his fingers again. And when her life hangs in the balance, he will not let anything—or anyone—stop him from saving her, even as his own life dangles by a thread. 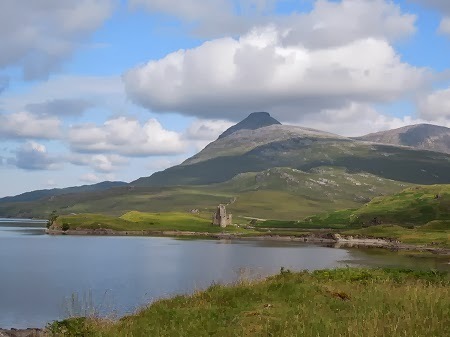 Last time, I did a post about Ardvreck Castle on Loch Assynt in Sutherland, Scotland. Now I want to show you photos of Calda house, next door. 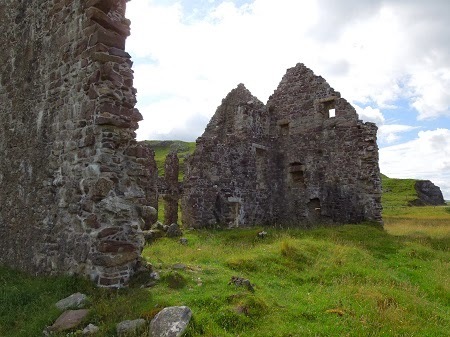 On our first visit to Ardvreck Castle, we didn't get to see much of Calda House because of the rain. But this time we walked all around Calda and even inside it. 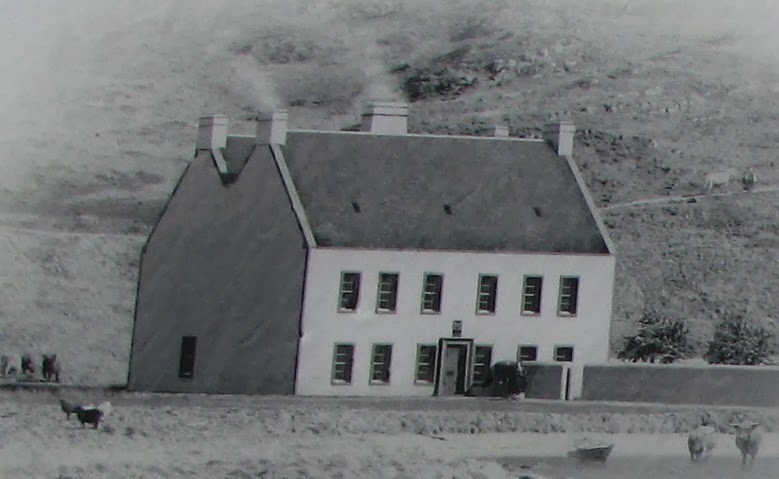 Kenneth MacKenzie II of Assynt had Calda House built in 1726 for his wife, Frances. She didn't enjoy living in Ardvreck Castle. 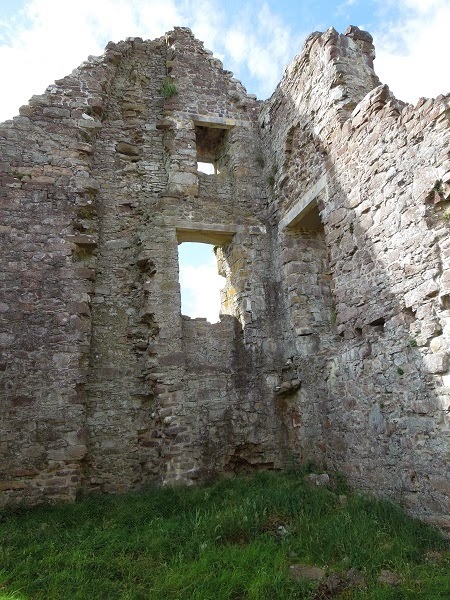 No doubt the castle, which was hundreds of years old by that point, was cold and drafty and without many comforts. 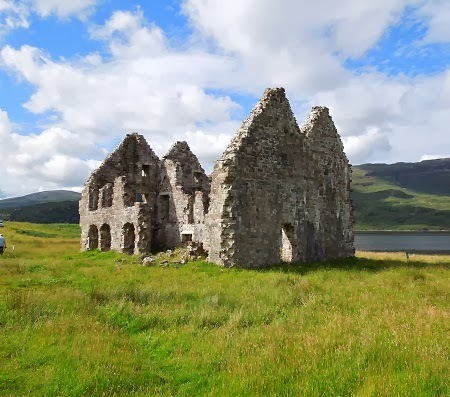 When the house was built, it was the most modern in the north-west Highlands. As you can see from the photos, it has an M-gabled roof and what's known as a double-pile plan. 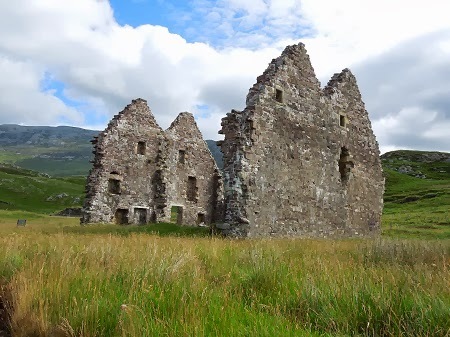 Many of the MacKenzie lairds' homes in Wester Ross were later built with similar architecture. Each of the three floors contained six rooms. On the ground floor these were the hall, parlour, dining room, kitchen, pantry/scullery, and servants hall. The upper floors contained bedrooms. Unfortunately, the MacKenzies had a massive amount of debt because they'd supported the Royalist cause. They actually could not afford the extravagant house when it was built. After ten years, the family was in financial ruin. Two men wanted to buy the house and Assynt from Kenneth. One was the Earl of Sutherland and the other was the MacKenzie Earl of Seaforth. Sutherland won and purchased the property. But the MacKenzies of Assynt and the Sutherlands had been enemies for many years. MacKenzie supporters looted and burned the house on May 12th 1737. They vowed no Sutherland would ever live there. They reportedly did some other damage in the surrounding area on their spree of violence before slipping undetected from the area. And this is said to be the last instance of vengeful clannish feuding in Sutherland. How sad, and what a waste, that such a nice house was only lived in for approximately ten years. 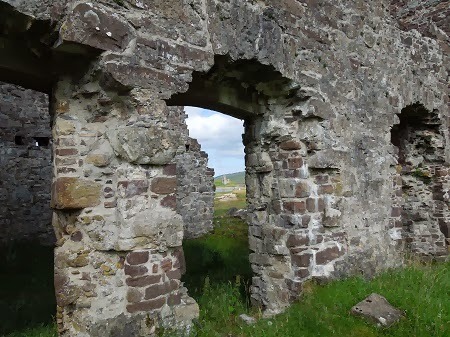 Sometime around the 1780s, many of the home's remaining stones were broken apart and taken by boat to build the first parochial schoolhouse at Kirkton (Inchnadamph). 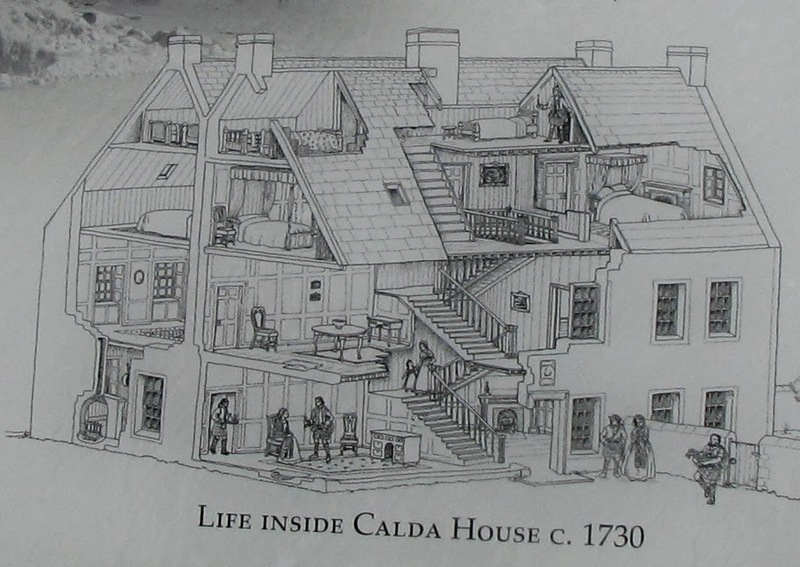 Below are artist drawings of what the house must have been like. These signs were on the property. What the house probably looked like in its heyday. Click to enlarge. 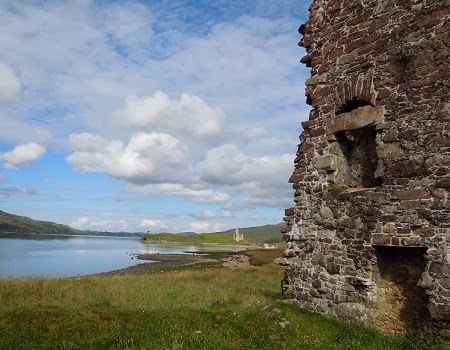 One of the interior walls of Calda House, with Ardvreck Castle and Loch Assynt in the distance. My Notorious Highlander: Chief Torrin MacLeod vows to possess and wed the spirited lady who stole his heart the previous winter. But Lady Jessie MacKay wants naught to do with the dangerous warrior, no matter how devilishly handsome and charming he is. When Torrin arrives unexpectedly at Jessie's home, along with Gregor MacBain, a man Jessie was formerly handfasted to, she is thrown off-kilter. She never wanted to see either man again, but now they are vying for her hand. Torrin promises to protect her from the devious MacBain, but how can she trust Torrin when she has witnessed how lethal he is? The more time Torrin spends with the strong and independent Jessie, the more determined he is to win her heart. Once she allows him a kiss, he feels her passion flame as hot as his own. After she knows Torrin better, Jessie finds herself falling for the fearsome Highlander. But the odds are stacked against them. The sinister MacBain is bent on kidnapping Jessie, making her his bride and killing Torrin, while Jessie's conniving younger brother, Haldane, is determined to use Jessie to take over the castle in his older brother's absence. Jessie fears she can never be with the man she loves, while Torrin will do everything in his power to ensure they are together forever. In his heart, she is the only lady for him. First kisses. Aren't they the best? Well, sometimes they are the expression of a longing that has been building for some time. Sometimes they can be awkward if the couple is still getting to know each other. But always there is emotion running through that intimate gesture. In my most recent release, Her Royal Bodyguard, Rico and Angelina are pretending to be newlyweds. When they reach his aunt and uncle's villa, where they will be hiding out, things get a little more emotional than they expected. “My daughter, Maria,” Rosa said. “You didn’t have a wedding gown?” Maria looked even sadder. Angelina forced a smile. “I wore the dress my mother was married in.” She’d always thought it would be wonderful to wear her mother’s wedding gown, but knew she’d require a designer dress when the time came for her real wedding. Both Maria and Rosa sighed. Rico shifted on his feet. “What color were your flowers?” Maria asked. “What?” he asked, backing up a couple steps. “Oh, yes,” Rosa said with a big grin. “Kiss her, Rico.” Giuseppe just laughed. Angelina’s heart fluttered wildly. If they were wildly in love, they wouldn’t balk at sharing a simple kiss. Her gaze zeroed in on his mouth as he slowly crossed the lobby until he stopped in front of her. She tipped back her head to look up at him and her tongue darted out to moisten her lips. Like was too small a word to express the press of his lips against hers. Like could never describe his scent enveloping her, his taste bursting on her tongue when she parted her lips and he rushed in to claim her mouth. Angelina wrapped her arms around his neck. Shivers danced along her skin. Her knees trembled and she might have sunk to the floor if he hadn’t been holding onto her so tightly. A moan she never expected rose from somewhere deep inside her. Rico froze then, broke off the kiss and snatched his hands from her as if he’d been burned. If they hadn’t had an audience she thought he might have pushed her away from him. Perhaps he got a little more lost in that kiss than he expected, just as she had. She lifted her arms from around his neck. He slowly stepped away, his eyes everywhere but on her. Angelina tried to calm her racing heart. She’d never been kissed like that before. Her body had never burned like this. She fumbled with the strap of her borrowed purse. Rico still wouldn’t look at her. Had the kiss been that bad? “Take them up to their room before they embarrass themselves more,” his uncle grumbled. Her Royal Bodyguard is book #2 in my Her Royal Romance series. Her Royal Masquerade, book #1 is also available now. Later this year you can expect more Royal Romance books, including Her Royal Mistake, Her Royal Scandal, and more. If you'd like to sign up for my mailing list to get info on these new releases and newsletter only contests, you can signup here. And how about you? Any first kiss stories you'd like to share???? Bound by Danger Turns into Bound by Trouble! Her Royal Bodyguard is Here!